On Tuesday 7th July we visited the Crushed Chilli Art Gallery in Durham to make some glass ornaments. If you haven't visited this working gallery for a workshop, we can't recommend it highly enough. We had a fantastic time designing and creating our glass butterflies and learning all about how the kiln works and how glass can be used in art. The end results were all individual and look absolutely stunning. In the afternoon we took a trip to the Cathedral to investigate how glass has been used in stained glass as both decoration and also to tell stories. We compared modern and traditional windows and then had time to sketch our favourites. When we return back to school we are going to design and make a silk painted "stained glass window" depicting Durham. On Wednesday 24th June, years 3, 4 and 5 took part in a day of sporting events at Maiden Castle. We had the opportunity to develop our skills in a sport by working with specialist coaches. Mrs Williams worked with the tennis group and we had a great day playing matches with children from other schools. Wimbledon here we come! During our P.E lessons this half term, we have been focussing on dance and in particular, May Pole dancing. We had lots of fun learning the complicated steps and learning how to create intricate patterns using the ribbons. Imagine our excitement when Durham County Council contacted us and asked for our opinions about the new park that is being built at Salisbury Road. We held a meeting with Barry Alderson who asked for out thoughts and opinions about new equipment. We were very vocal in our discussion and Barry was very impressed with the suggestions that we made - several of which had not been considered by Durham County Council. We can't wait to see what the new playground will look like. Kevin, the school chef, invited us to take part in a baking competition held each year by Taylor Shaw. As we were studying the Mayans this term we decided to create some biscuits inspired by food they are famous for - chocolate and chilli. We researched different biscuit recipes and held several trial runs to find just the right amount of chilli to add. Watch this space for a recipe for home. On Monday 18th May, we were incredibly lucky to be invited to the official opening of the new Police HQ at Aykley Head. This was a very prestigious event as there was a royal visitor in attendance - Princess Anne! We formed an official line for her to walk along and waved Union Jack flags with great enthusiasm. Afterwards, we took part in a range of activities from building tetrahedrons to making badges. A member of our class even won the quiz competition and was awarded a Kindle Fire - well done Seth! We had a fantastic day and thoroughly enjoyed ourselves, although as we walked there AND back there were a few tired children (and teachers) by the end of the day. For the last few weeks, we have worked closely with Dave Ross from Durham County Cricket Club on a media project. This has involved writing a script to present a sports report about Durham winning the Royal London One Day Cup back in September. We've had the opportunity to interview the actual players who took part in the match and then read our scripts using an autocue in the actual Sky Sports news room at the Riverside Ground. This has been a fantastic experience for everyone, one of the players even kindly took the time out of his day to sign autographs for all 33 of us! Welcome back! I hope you all had a lovely break and are raring to go again. I can't quite believe a whole term has passed since I started teaching you. We've got a fantastic term ahead with lots of interesting topics and trips planned. P.E this term will be on a Thursday and a Friday afternoon so please make sure you have your PE kits in for then please. To see what topics we will be covering, why not have a look at the term overview at the bottom of the page. On Tuesday 10th February, some of the children from our class attended a computer challenge morning at Framwellgate Moor Primary School. We were given the chance to work with children from different schools and developed skills including collaborative working, listening and computer programming. It was a fantastic morning and thoroughly enjoyed by everyone who attended. The children were a credit to the school, behaving and working in an exemplary manner. During the last week of the first half term we took part in a Judo session. This was a quick paced and energetic introduction to what to expect from a judo class. Mrs Williams was tired just watching! We all thoroughly enjoyed the session and felt we learnt an awful lot about the skills and disciplines of judo. We have spent the last few weeks investigating forces and this has meant A LOT of practical science investigations. We particularly enjoyed investigating how different variables might alter the size of a crater. Happy New Year and hello! My name is Mrs Williams and I will be your class teacher and Acting Deputy Head Teacher for the next two terms. We’ve got some exciting lessons lined up for this term and I can’t wait to get started. Our topic for the spring term is “Vicious Vikings” and we will be learning about Viking life, invading and settling and their beliefs and way of life. We will be designing and making replica longboats and Viking helmets as well as looking at their musical instruments. Our science topic is “Forces” and we will be conducting lots of practical science experiments to investigate the different types of forces. Our PE lessons will focus on gymnastics and dance and will be on a Tuesday and Wednesday, so please make sure you have your kit in on those days. I hope you have had a restful break and you are ready and raring to go for our new school year! This term we are learning all about Extreme Earth and Spectacular Space. We will begin our journey looking at Britain and the United Kingdom (as well as the current Scottish Referendum for independence), before we move to studying Europe and the rest of the world. We shall investigate earthquakes, tornadoes and volcanoes and the impact they have on humans. After this we shall venture into space where we shall find out about the planets. Which ones are rocky? Which are gaseous? We shall studying the Sun and the Moon. I am looking forward to have a great time this year and learning lots of new things whilst having fun! Please find a copy of the Topic Overview which was handed out at our Meet the Teacher evening at the bottom of the page. We were very fortunate to have a visit from Dr Tom Robson recently. He was very inspiring and encouraged us to think about how we could solve problems that might arise through our own actions and thoughts. He called this ‘Diamond Power’ and suggested that by taking responsibility ourselves we increased our Diamond Power whilst letting others solve our problems was a bit like giving away our Diamond Power. Something else he taught us was about ‘Emerald Power’, this was about how to face challenges and that when we make mistakes or get things wrong we can become stronger through learning how to deal with them, therefore we increased our Emerald Power. We learned that facing our problems through keeping calm made us a stronger person and better equipped to deal with a similar problem in future. We really felt that we learned a lot from Dr Tom as it really made us think that by taking responsibility for our own actions we could grow as individuals. Report by Finn and Aimee. As part of our work during European Day of Languages, we were very fortunate to have Mrs Hamill (one of our Parent Governors) pay us a visit. For our session, we learned about the French terms for the planets in our Solar System, linking this to our work this term on Extreme Earth and Spectacular Space. This week, we have been studying the work of various 17th Century artists and how they created depth and used perspective to create realistic interiors. We have studied the horizon line and vanishing points and how to use construction lines in artwork, this was rather tricky! We began by drawing a tree lined road where we used the vanishing point and construction lines to ensure our trees were drawn in perspective. After this we began the task of drawing a room (with another room behind it), we then had to add detail to it including windows, artwork, flatscreen TVs, rugs, floor tiles as well as showing detail from outside through the open back door! We found this work challenging, however we have all learned how to use construction lines to create depth within a picture and we are very proud of our work, please have a look at it below! So, we were all packed and ready to head off to Maiden Castle to take part in the Mini - Olympics, because there were so many of us (everyone in Years 1-6 took part) we had a fleet of buses! Once we arrived we had to take our place around the track for the parade, each school was assigned a country and we were Canada. Two of our pupils paraded the Canadian flag (designed by Year 1) and we gave them a huge cheer, we were ready to learn a new sport and compete! Shortly after, we all went off to our events, in Years 5 & 6 we took part in volleyball, netball, judo & boxing, dodgeball and tennis. In the morning we had sessions where we learned the skills and tactics involved in our sport, after lunch we then competed in a tournament. We all learned something new to further enhance our sporting skills and we were certainly very fit today! 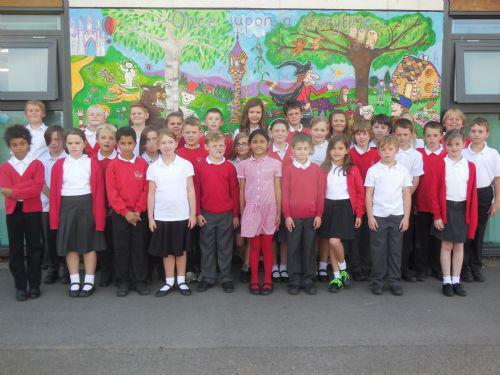 **Please see the Year 6 page for additional photos of pupils in Year 5.